The Blue Ridge Parkway, voted ‘America’s Favourite Drive’, is a 469 mile track through the Appalachian Highlands connecting Shenandoah National Park (also known as the Skyline Drive) in Virginia to the Great Smoky Mountains National Park in North Carolina. 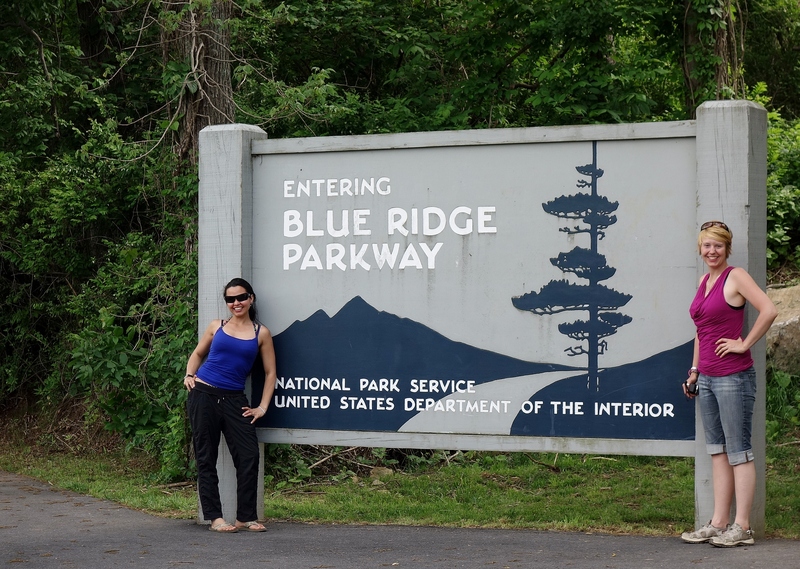 After a thousand miles of unsuccessfully trying to connect to our destinations (Canada, New York City, Philadelphia, Washington D.C.) without the use of major 6 lane, high speed, road rage type freeways, the Blue Ridge Parkway (BRP) is a breath of fresh air. It is a narrow corridor weaving its way, uninterrupted, through thousands of acres of protected land. It is fiercely green and lush with hundreds of lookout points designated at elevations between, 500 to 5,000ft giving breathtaking panoramic views of just how far it extends. Beyond that, the surrounding nature is continuously changing as altitude affects the climate of given areas, altering the vegetation from the valley floors to northern species on the mountaintops. This small section of America can easily indulge weeks of your time. The views from the road alone are stunning. Trails heads etched on outlook boundaries fork into endless miles of walking, hiking, climbing, fishing, and swimming routes. Not even ¼ mile separate some of these outlook posts. And it seems that just when you start to get hungry, need to stretch your legs or find yourself craving a bit more brain food, a visitor center pops right up. Some are just a small cabin fittingly equipped with peppy and helpful rangers (reminiscent of a stereotypical Canadian Mountie; and I say that with love). Others are modern, informative and high-tech interpretative exhibits. Several National Park areas also offer camping and RV facilities right on the BRP. The Blue Ridge Music Center is particularly wonderful. Learn all about the origins of country music right where it all began. Better yet, hear it from the story tellers themselves, live until 4pm. First of all, take your time. This is not a destination road. It is all about the journey and this is slow moving one. The Blue Ridge Parkway is completely free to drive as is the entrance to all national parks encompassed. Make sure you fuel up in town and get your groceries picnic ready because there are no amenities available on the BRP. This is also a great excuse to veer off into little places you would otherwise miss. Put on your boots and let your feet take you deep into the forests. There are hundreds of options for accommodations for every level of demand. We found campgrounds to be way too expensive for a simple piece of grass. Put on your best smile for a local and you could park in their backyard for free. While so many have attempted to make profit of the natural beauty that the parkway has provided, there are still treasure troves of wild land and stunning rock perches to be climbed. You will just have to find them on your own. Well done! I love the Blue Ridge!!! We miss you Ben! How’s the book coming? What a fantastic experience – your pictures of the views are spectacular! Thank you 🙂 I know I kinda overloaded this story with photographs but I just couldn’t decide. So much spectacular scenery. I know it’s off topic, but I really like your tattoo!! haha! 😛 Thanks. Me too. Good things since its FOREVER! It’s amazing. Well worth the license 😛 I don’t do anything the easy way so I got my license 3 months before I was due to drive across CANADA! 5,000 miles and several month later, I was a prostar in love! Good luck. The views are so awesome! Would love to visit this place while I’m in Virginia. Make sure you leave loads more time than you would think it takes. You will want to stop at every outlook. Gorgeous! Great post. Looks like a great place to visit. I’m a big fan of country music so will have to make a stop at some point! Would love to make that drive someday, seems like a beautiful place! Just last night a friend was trying to convince me to include North America on my list (I haven’t for a really long time) saying the topography is just stunning. You just proved it! Cool shots! Looks like a nice outdoor adventure, player!!!! Looks like one of the best drives for a long road trip! Would also love to check out and learn more about the Cherokees. Those are some amazing views!! I love roadtrips!